Actually, the opposite is true. If the USA is not the least violent country in history, then it’s one of them. This country was founded on the principle of individual rights, which is the means of shielding people from violence from the state. The history of the world before America is the history of unchecked violence from church and state wreaked upon anyone who got in their way. To give just one example, I’ve been reading about Queen Elizabeth, whom people romaniticize hopelessly. The woman was a tyrant. Merry Old England had no civil rights. The Queen could have someone thrown into the Tower of London if she suspected he was conspiring with Catholics to overthrow her. And you didn’t want anyone whispering you were an atheist. Aside from state violence, Elizabethan culture was brawling and violent. The playwright Christopher Marlowe was killed by a stab in the eye during a bar fight (that might have been the assassination of a spy who knew too much). The playwright Ben Jonson killed an actor (and has been the hero of playwrights ever since). The playwright John Marston pulled a gun on Jonson; Jonson grabbed the gun and beat Marston over the head with it. (You did not want to mess with Jonson.) And that’s just the violence among playwrights! Throughout history might has made right. What constitutional rights had the Huns, the Vikings, the American Indians or any other pre-capitalist society? The notion that America ranks high in violence historically is laughable. How does America rank today among the rest of the world? A study from the mid-90’s shows America to rank 36th in suicides and 24th in homocides. That’s with over half the nations in the UN, including the former Soviet Union and many nations in Africa and Asia reporting no data at all. A complete, unbiased study would probably show America further down the list. America did have a higher homicide rate than any Western European nation in that study. But the rate since then has trended down dramatically. 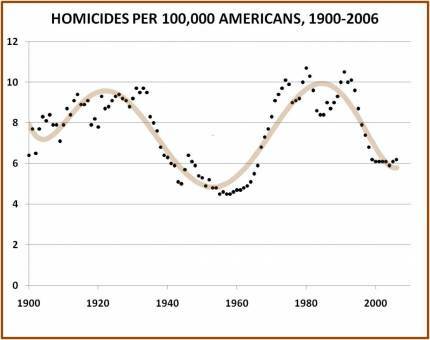 Wikipedia shows American homicides trending way down since the 90’s. Although there are still far more homicides per capita than France, violent crimes there surpassed the US in 2001. That shocked the French, who tend to refer to high-crime areas with such phrases as “a real Bronx,” or “a Chicago” — a crime-as-Americana vocabulary common across Europe. Violent crime in the UK has soared. We also suffer more violence than people in the US or even SOUTH AFRICA, figures show. A shocking 2,034 per 100,000 people suffer violent crime in the UK, compared to 466 in America and 1,609 in troublespot South Africa. Britain’s damning figures far outstrip those of second-worst EU country — Austria, with 1,677 violent crimes per 100,000 people. And the UK rate has increased by a shocking 77 per cent since 1998. The numbers were released by the European Commission. They also tell how Britain has the second highest OVERALL crime rate in the EU. I’m not sure why violent crime is rising in Europe, but I doubt that it’s because European kids are watching too many American movies and video games, as some Europeans think. Some blame the United States outright, saying it exports gun-driven violence as blithely as it does software and Boeings. Calls for banning blood-soaked video games, Hollywood movies and hip-hop music videos are just as loud as calls for gun control; this week the German government proposed restrictions on violent computer games. I would guess it has more to do with changing demographics. America has more homicides than many nations, but Spike Lee’s statement just shows his ignorance and his anti-American bias. I have seen statistics showing that if you just look at white crime rates in America, America is one of the most peaceful countries in the world. It is black and hispanic crime rates which are way above the proportion of their relative populations. The question to ask is why is that? I think the answer is a combination of factors: the welfare state, public education, labor intervention laws, and of course the victimless crime laws. Without these civilization destroying laws and institutions, I am willing to bet that crime statistics would plummet for everyone but especially for blacks and hispanics. Mc Whorter argues that the black demographic sees itself as a perpetual victim of white abuse and oppression chiefly because of their experience with the police. Because of drug prohibition, blacks are constantly profiled and arrested and involved in gun battles with white police officers. As a result, their whole psyches are affected. They see themselves at war with white America. I think there is something to this although I think Leftist ideology is involved as well. But Mc Whorter makes a good argument that if the drug laws were abolished, the black experience in America would be radically changed. I often wonder if this alone could weaken the Left’s iron grip control of the black population. Spike Lee grew up in Brooklyn and undoubtedly was subjected to racism. This doesn’t excuse Lee’s militant Leftism but it does explain why blacks like Lee so willingly adopt a philosophy which clearly serves a cover for their own racist pathologies. Several studies have linked that high in crime in the US to the height of “gun control” laws, and the subsequent dip to the general restoration of the right to bear arms that the last few decades have seen. The same studies mention Europe’s steadily increasing outlaw of self-defense and their vast increases in crime. While not part of the U.S., Mexico also serves as an example of this. Strict gun laws and drug prohibition. Much more leftist than any U.S. jurisdiction And observe the results! Oh yes, good point. Mexico as a Leftist country is something that Conservatives always overlook for Mexico as a Latin country. But it is Mexico’s Leftism that is responsible for that country’s pathologies. What about Canada? Drug prohibition, strict gun control, and very low violent crime rates. Our violent crime rates are rising in Toronto, associated with Jamaican gangs; out West it is associated with Asian gangs. 47 cops have died in LA over last 30 years; 8 in Toronto for same time frame. Drew, interesting comment. My guess is that Canada is more racially homogeneous than America. I know the BioConservatives would say that the problem is strictly due to lower IQ among Hispanic immigrants and greater genetic propensity towards violence among blacks and Hispanics. I don’t have an answer for this other than drug prohibition, gun control, welfare-statism, labor regulation, and public education are the major contributors to modern crime. What effect race and culture has on crime is an open question for me.